Recently there has been much hype surrounding the so-called “opioid epidemic”. Politicians are sounding the alarm and declaring a State of Emergency. In one sense the tangible risks are very real, as clearly there has been an upsurge in heroin and prescription drug overdoses. This unfortunately has been leveraged as a bully pulpit to exploit personal agendas by politicians seeking fame as “get tough on drugs” propagandists. In another sense, many legitimate pain suffers have lost access to much needed medication which largely has been ignored by politicians. Unfortunately, the day-to-day struggles of these individuals (and their families) to achieve even a marginal quality of life are buried beneath an avalanche of commentary that stigmatizes and marginalizes them, as seen at a previous blog post with close to 150 patient stories, Patients Share Humanistic Side of Living in Pain amid Lawmaker Opioid Hysteria. In response to the epidemic and the need for quick reversal of opioid toxicity, Kaléo Pharma has developed Evzio, a naloxone (Narcan) auto-injector. According to Kaléo’s website, they are a pharmaceutical company focusing on the repackaging and manufacturing of current pharmaceutical and medical products with the consumer in mind. As such, naloxone is not a new pharmaceutical drug; rather, it is the preparation of naloxone in this convenient delivery system that is novel to the market. 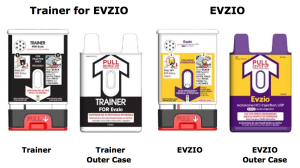 Evzio is a delivery system containing naloxone, a mu-receptor antagonist, packaged as an auto-injector much like an EpiPen. While EpiPen is designed to deliver a controlled amount of epinephrine to halt anaphylaxis, Evzio is designed to deliver a standard amount of naloxone (0.4mg/0.4mL ) as a single dose, single use injection. Each box contains two injectors and the manufacturer recommends that a second dose may be given after 2-3 minutes if symptoms of lethargy and respiratory depression have not improved. It is important to immediately call for emergency assistance (911) following the first dose of Evzio even if the patient improves, as the half-life of naloxone is very short and treatment may require a continuous naloxone infusion with close monitoring. While the patient may appear improved, he/she may return to an emergent state of listlessness if advanced medical services are not sought. Evzio is designed to be administered in the outer part of the thigh, through clothing if necessary. 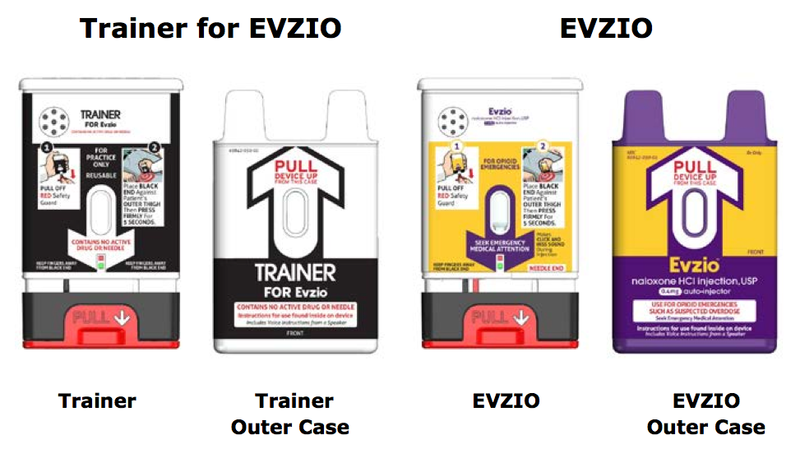 A significant difference between Evzio and the EpiPen is the additional technology accompanying the device. When Evzio is activated, by removing the device from the outer casing, an automated voice begins talking the user through the injection process, similar to the automated directions users encounter when opening an automated external defibrillator (AED) device. This creative approach by Kaléo could hopefully reduce potential for user error by an otherwise illiterate caregiver, persons that are unable to read English (only available in English for now), or even a young child, to administer the lifesaving drug. The system is also accompanied with visual instructions for those who are hearing impaired, or in a situation where the electronic voice system fails. Of note, prior to injection, it is important to examine the naloxone solution through a small window viewer to ensure the solution is clear and devoid of any particulates. Should the solution be cloudy or contain particles, the device should not be used. Signs and symptoms of a possible opioid overdose that could benefit from Evzio include, but are not limited to, respiratory depression, excessive sedation with inability to arouse the patient with a firm shake, pinpoint pupils, bradycardia and/or hypotension. In the event a patient overdoses on a partial agonist or a mixed agonist/antagonist such as buprenorphine (Suboxone®, Sebutex®) it is important to note that reversal of respiratory depression may not occur, and higher continuous infusion doses of naloxone may be required for complete reversal. An overdose of buprenorphine, for example, presents a much more difficult situation as buprenorphine’s affinity for the receptor is greater than naloxone. The pharmacological rationale for this is discussed in another earlier post at Bupes, and Subs, and Surgery, Oh My. As with any naloxone administration, acute withdrawal syndrome can result with the abrupt reversal of opioid activity in a person who is physically dependent on opioids which may include, but is not limited to, symptoms such as tachycardia, abdominal cramps, hypertension, piloerection, nausea/vomiting, and sweating. Kaléo includes the following warning of adverse drug reactions seen with opioid reversal in postoperative patients: hypo or hypertension, ventricular tachycardia and/or fibrillations, dyspnea, pulmonary edema and cardiac arrest. So what are the implications of this new drug delivery system in light of the well documented rise in heroin and other opioid use? Should Evzio be provided as a mandatory order set accompanying every patient newly prescribed opioids or those at an elevated risk of opioid overdose? As many patients use opioids safely and effectively every day, providing this device routinely without assessing risk is probably cost prohibitive. But, for chronic pain patients, particularly those who are prone to unintentional duplicative doses (due to poor memory, such as our geriatric populations), or others that have elevated risks for opioid therapy, this device should help to mitigate unintentional overdose if the subject is caught in time to reverse respiratory depression. In an effort to address the heroin epidemic currently plaguing Massachusetts, the Governor has begun to formulate legislation that will allow for standing orders in community pharmacies to purchase these devices without a prescription. This could provide a useful lifesaving tool to concerned family members of addicts struggling with their addiction. To view a live demonstration by Student Pharmacists Erica Wegryzn (WNEUa, Pharm.D. Candidate 2015, firefighter 911 responder) and Jeffrey Bettinger (ACPHSb, Pharm. D. Candidate 2017, initial responder administering a naloxone reversal); and Pharmacy Resident Dr. Thien Phamc (opioid overdose casualty), click on the photo below. No part of this blog or video was sponsored, reviewed, or supported by Kaléo Pharma or affiliates, or any of the colleges listed. This blog was developed by Erica Wegrzyn, B.S., B.A. She is a Pharm.D. Candidate at the Western New England University College of Pharmacy, Springfield MA. It was revised and edited for final posting by Dr. Jeffrey Fudin. 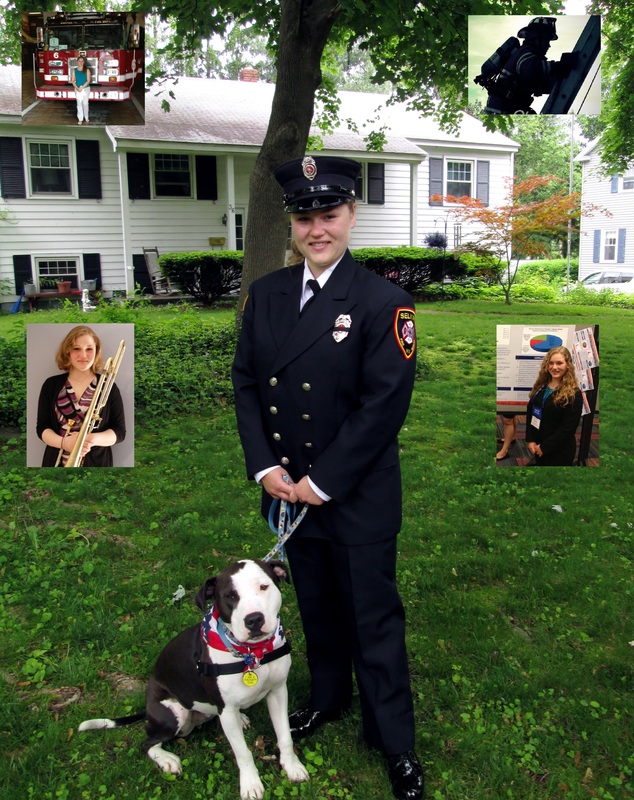 Prior to attending WNEU College of Pharmacy Ms. Wegrzyn received her bachelors’ degrees in Biochemistry and Music (trombone) from Ithaca College. Having taken a recent interest in pain management, she is excited to begin the process of applying for PGY1 residencies. Ms. Wegrzyn was also thrilled to return to the Albany area for APPE rotations where she is a volunteer firefighter with Selkirk fire district and also volunteers with “Out of the Pits” pitbull rescue. Ms. Wegrzyn is pictured here with her therapy certified and Selkirk resident fire dog, Blue. You make us back here in Springfield proud! It is surely a delight to be working with Erica. In the short time she has been with us, she has had a positive impact on our Pain program, patients, and the profession. WNEU College of Pharmacy should be proud to be placing such qualified, exemplary students on APPE rotations. The professional medical, pharmacy, and nursing staff has come to rely on Erica for critical information and patient follow-up. So far thumbs up to WNEU and their new found film industry minor! Thank you for the informative post. Sadly many chronic pain patients are being treated like criminals because of the few that DO not follow the doctor’s orders. Many pain specialists are being made targets by officials and pharmacies are refusing to fill legal prescriptions. I have been a chronic pain patient for almost 20 years. No surgery can fix my health. But I am a DNR because I hate what little life I have. Take away the narcotics and I lose the ability to walk or stand. I won’t live like that. Why must we suffer because of the criminals? Thank you again for the compassion you show. I have tried for several years to get the state of Kentucky to adopt the use of naloxone (Narcan). Due to my dismay it has fallen on deaf ears, yet for every letter I send on behalf of Chronic Pain patients I receive a rebuttal letter on how many people in KY are over dosing, yet right here is the answer. We have had many good Dr’s leave KY due to the law’s that have been imposed in this state. One of which you did a story with…….I do not and will never understand why knowing there is an issue rather than use naloxone. Many thank to you and to Erica Wegrzyn, B.S., B.A. If only more doctors and politicians would see how this would benefit many, maybe just maybe there would be less suffering by all involved. First, thank you to the authors of this fine column and for Dr Fudin for providing the outlet for sharing such information. * “When the Office of National Drug Control Policy released this Administration’s first National Drug Control Strategy in 2010, we established a NEW blueprint for reducing illicit drug use and its consequences in America………..
How was one to know that the ‘new direction’ would allow for recreational drug use (MJ) yet at the same time suppress LEGITIMATE care for those who are desperate for relief? Seems almost like a Twilight Zone episode no? Rather surprisingly one would think failure to implement such common sense programs, like using naloxone in KY to save lives, as Sheila mentioned, would open up the eyes of OD ‘victims’ loved ones to the fact that they are being used as pawns by the likes of Kolodney and his PROP stooges, our overstaffed, overfunded, bloated, and mostly unnecessary government agencies like the DEA, and ever present baby and bu** kissing politicians seeking popularity by getting tough on drugs. But alas, American propaganda is a fine tuned instrument, truly an amazing work of art, especially at infiltrating the shallow minds of the tv babies who worship at the alter of the idiot box, and those who take no notice of issues unless they affect them specifically. Sheila, you say “If only more doctors and politicians would see how this would benefit many, maybe just maybe there would be less suffering by all involved”. I and others are deeply indebted to you and others that tirelessly advocate for legitimate patients, HOWEVER, please do not be so naïve as to think that their inaction is caused by some inability to SEE how these approaches would benefit our current situation. They are NOT unaware that we, as disabled American citizens, are collateral damage. Collateral damage in war is unavoidable. SO to be frank, for one to say that the politicians/DEA/PROP didn’t see this coming or are presently (or at any time) unaware/unable to SEE is blissful ignorance on the part of anyone that advocates for patients and their rights to proper medical treatment OR gets mad at and blames the addicts for our predicament. The addicts are there, and always have been, to blame our predicament on them is foolhardy and an easy out for those who oppress us and suppress our basic right to passionate treatment by this country’s ‘world class’ medical system. At this point CPP are but grains of sand in a giant dust-storm. They are hoping we take the route poor frustrated Mark outlined in his post below (Mark, hopefully you will rethink your current plans and at some point be reinvigorated as you sir are just the type of citizen this cause needs the most). The zealots realize we have enough trouble just getting through the day and tending to what little of our life and families as we can WITH proper care. W/out which we are ALMOST unable to fight back. I know this fight looks unwinnable but we cannot give up. We CAN ensure proper care despite the entrenched interests backing the drug war for their own personal gain as if it were an growth industry; which it most certainly is.. It is near impossible to deny at this point. Continued funding by a cash strapped govt despite its meager results, waste of tax dollars, corruption, and abuse of civil liberties makes no sense in light of the financial situation this country finds itself in AND more importantly, the basic values on which this great country was founded on, liberty and freedom from govt oppression. This thing about heroin frightens the hell out of me ,I’ve never touched this drug but had a friend that tried it just once and he has not been the same since. His friends told him nothing is like the first time you do heroin and from then on you chase that one time good feeling to never retrieve it again. I did everything I knew to do to help him, got him in to a methadone clinic but nothing was ever good enough . When I found he had borrowed a lot of money from 6 different cash loan places I had to separate myself from him. He was bringing me down along with his bad habit with his addiction to heroin. All the lies and deceiving had to stop. This rescue medication Evzio should save lives but people need to know these pain medications are dangerous and could cause respiratory depression and that means it stops you from breathing when certain people abuse them,something we don’t think much of till its too late. Now time has passed and things have gotten so bad I cant get my one opioid script filled for my legit health problem I have with chronic pain in my spine. I have well documented test like MRI’s several of them over the years, Cat Scans and other test that shows degenerative disc disease .I received very good pain relief from opioid therapy and I thank the 4 doctors that helped me over a 20 year period. But this thing with not being able to get my one script filled that helps me very much with my chronic pain caused great stress I don’t need in my life at this point. Just 3 months ago I was receiving the proper amount of this opioid then things went all wrong. Two months ago no pharmacy would fill my in hand script ,so I had to step back and inventory the past years , what would be my best move from here on out. My decision I’ve decided to titrate off this medication and get it out of my life . What a crazy mess our own government has blown out of proportion. Blame the DEA or whoever for pressuring Pain Specialist in to stop caring and prescribing for their suffering patients ,then scaring pharmacist in to ordering only of specific amount of opioids a week . I cant believe it has come to this with it being no fault of those that suffer from chronic pain. As I titrate downward I’m finding I’m able to deal with my chronic pain in a different way. I was forced to do this I had no other option. I will be okay but I feel bad for those that must have these medication to live a somewhat normal life. Dr. Fuidn has been more than nice to me and I want to thank him for all his hard work and for responding most my emails. I’ve never spoken to Dr. Fudin because he is a busy man, I know 4 other doctors just like him. People forget he has a job to do other than this blog alone. In time this will pass like things always do ,history repeats itself ,things will change in time because of doctors that care like Dr. Fudin . I’ve been writing on different blogs ,websites that have to do with chronic pain and the things chronic pain sufferers have been put through for many years. Will I continue to write on these websites when I’m done titrating off ,I really don’t know yet time will tell. Maybe its best I take a leave for now and everyone just wish me well as I wish all of you well. I hope this craziness stops and pain sufferers get the medications they need. Be positive and think ahead of what your next move might be, I hope people don’t get thrown in to withdrawal for no good reason, that’s crazy. We as pain sufferers don’t deserve this type treatment, its so inhumane to those suffering in ongoing chronic intractable pain. An amazing blog post Erica, Jeff, and Thien! This is a great example of how impactful Student Pharmacists and Pharmacy Residents can be in demonstrating how to save the life of a loved one with recently FDA approved naloxone auto-injector. Kudos to all of you young professionals! Please encourage your peers to watch, and share widely with your classmates. WOW! And once again, how we seem to forget the legit chronic pain patients. Off track when we are almost letting every drug abuser know, that if you get a “little” to high, you will be saved. Wow!! Once again we have forgotten about legit chronic pain patients. So if the drug abusers want to get a “good buzz” and over do a little to much, you will be saved. SCARY! !